With Rolex green presentation box. In good overall condition, the present watch delights with its striking blue dial and bezel, all original and visually pleasing. The gilt graphics on the dial are particular to the gold version of the reference and fit harmoniously. Being in yellow gold, the watch is technically a ref. 1680/8 even if the reference number engraved between the upper lugs and on the inside of the case back only identifies it as a reference 1680. 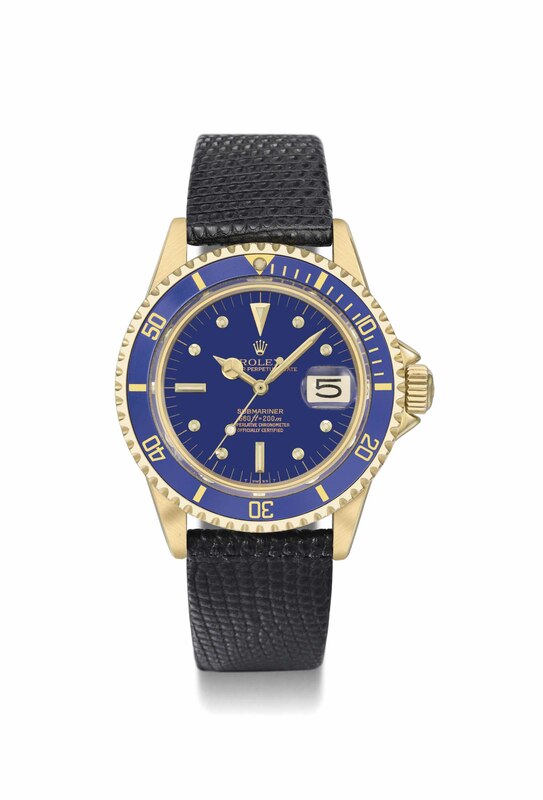 Rolex reference 1680 was introduced in 1969 and was the company's first Submariner with date. Available in either stainless steel or 18K gold, the standard version of this reference featured a dial and bezel in either blue or black. Reference 1680/8 is illustrated in Rolex Submariner Story by Franca & Guido Mondani and Lele Ravagnani, pp. 104-105 and p. 107, as well as in 100 Years of Rolex, likewise by F. & G. Mondani, p. 133.